#MoviesMusicPlaysFilmFestivalsConcerts: Film Review: "Guten Tag, Ramon"
This heartwarming and deeply moving Mexican film from director Jorge Ramirez Suarez has finally reached Netflix! This is one of the most perfect films for the big Thanksgiving week. 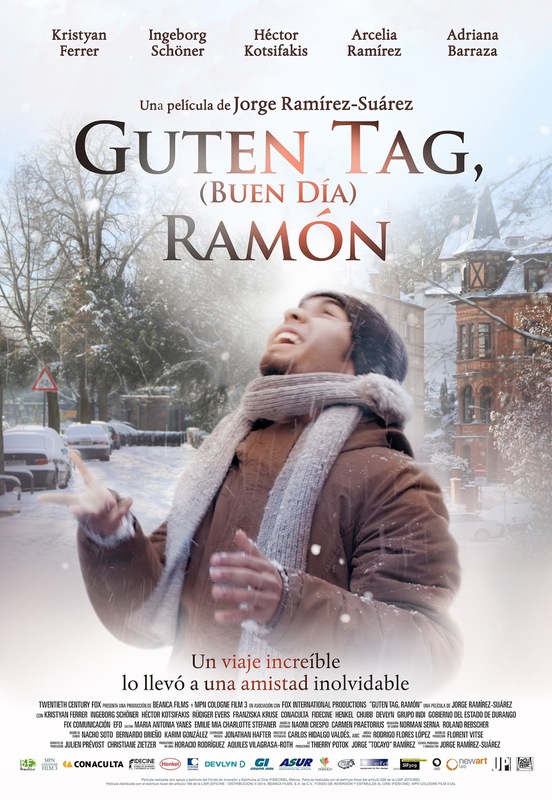 It's a beautiful story of kindness, generosity and friendship wrapped around a young man's inspirational journey from his poor and violent Mexican village to a prosperous German city where he discovers that the biggest barrier to human understanding is not the lack of a common language between people but the lack of compassion and empathy. Make sure you have a box of Kleenex handy. This movie was a big box office hit in Mexico and has received numerous awards since its release last year. It screened in US theaters spring this year. Young Mexican actor Kristyan Ferrer embodies the courageous and kindly spirit of Ramon whose only desire is to be able to help his grandmother get her medication and to help his mother put food on the table. He is smart enough to avoid the drug trade but attempts several times to cross the US border only to be caught and sent back to Mexico every time. Frustrated but unwilling to give up, a good friend suggests he goes to Germany and work with his friend's aunt. He decides to go equipped with zero knowledge of the German language, a few spare euros, a sheet of paper containing the step-by-step instruction on how to reach the aunt, and a wide-eyed excitement of the opportunity he was sure Germany would offer him. But when he arrives in Germany, he finds that the aunt has moved and no longer lives in the address provided by his friend. Desperate and scared, he returns to the airport to get a flight home only to be told that he needed to pay a couple of hundred euros for rescheduling fees. With his luck running out, he decides to return to the city where the aunt used to live in the hopes of meeting her by chance. He sleeps at the train station at nights braving the winter cold and, for food, he resorts to begging outside a deli where a kind clerk offers him food occasionally. A retired nurse who he initially meets at a park and later outside the deli, takes pity on him and offer her basement for him to stay. And his story turns for the better. Maybe. This film is a perfect companion piece to another moving immigrant saga, "Brooklyn", playing in theaters now. Both films feature wonderful performances from the cast and a hopeful ending that will make you feel so good about the world and will make you wish for that kind of heartwarming ending to cap your everyday endeavors so that you'll look forward to the challenges of the next day and the days after with much enthusiasm and excitement.